DISCOVER how you can CREATE ART that is UNIQUE to you, and you alone. Let ARTISTIC IMPRINT take you on a JOURNEY to find YOUR artistic imprint, so you can share your UNIQUE STYLE with the world. Patience, Ingenuity, and Persistance are part of the creative processes of design. How do I know this? From years of college level and beyond study and certifications? No. I learned this by looking at my own design process. How do I move from a problem or idea to the final product? How often do YOU have an idea in your head, something you need or want, wish you could make, etc, and rather than figuring out how to make or design it, you give up because it will take time and thought, and patience. Without patience, ingenuity and persitance, anything you want to create will not make it to completion. Aristotle said, "We are what we repeatedly do." So with that in mind, it's time to start a project we've been putting off, work at it a little bit each day, from planning, to gathering materials, to working on it step by step. The more we practice starting, following through, and completing a project, the more likely we are to succeed at the next project. 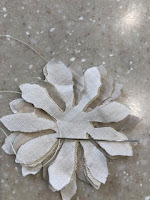 What better way to learn patience, ingenuity and persistance than through art and crafts? I needed some ideas for my daughter's wedding shower decor. As her wedding flowers were going to be sunflowers, I looked for sunflower decor. 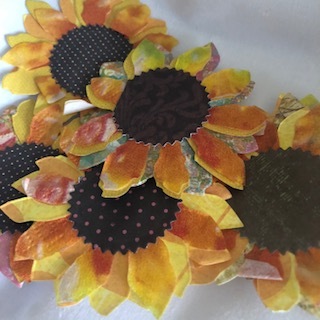 In addition to the decor for the wedding, I wanted to keep expenses down, so I decided I could make paper sunflowers that would be attached to baskets, the gift bags, tossed on the gift table, etc. 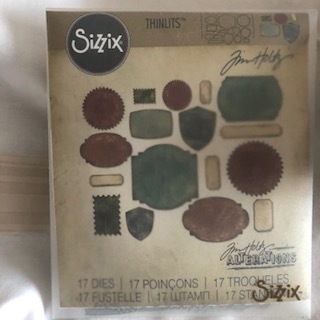 Most recently, I have been designing a fabric art journal. 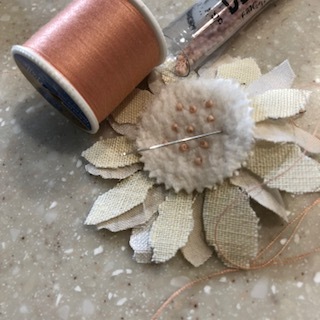 I thought a fabric flower would look nice on the cover. 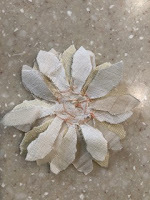 Now rather than going out and purchasing one, I decided to make one with the fabric scraps I had on hand. I knew there was a reason to save them! 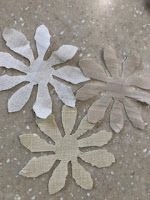 I cut 3 of the same flower shape using 3 different colors of fabric using the flower die. 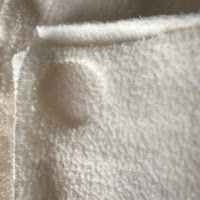 I then cut the zigzag circle from some soft fleece. 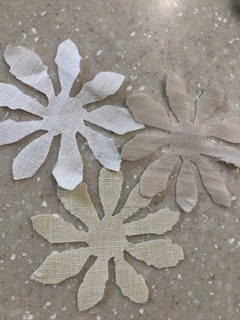 then basted them together with thread and needle. with carefully placed stitches. With each stitch I added a tiny bead. 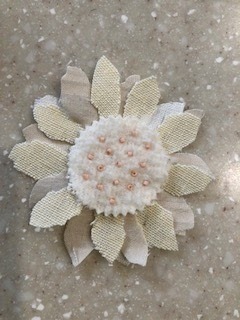 The fabric flower came out exactly as I had envisioned it. Taking the time to figure out how to make what I envisioned took PATIENCE. Using what I had took INGENUITY. Following through with the idea took PERSISTANCE. What idea do you have that you need to take action on? Leave a comment below. I'd love to hear about what you are ready to start working on. Write down the answers to each of these questions on one sheet of paper. 1. How often do you start a project, have a great idea, have a dream? 2. How many of those projects were started, great ideas and dreams acted upon? 3. How many of those projects were finished, great ideas developed, and dreams fulfilled? 4. How do you feel when you have a project, idea or dream? 5. How do you feel when you prepare to start the project, idea, or dream? 6. How do you feel once you have started the project, idea, dream, and you get that feeling that what you are doing doesn't matter, or no one will like it, or something along those lines? 7. How do you feel when you completed a project, developed the great idea, or fulfilled that dream? I bet you are feeling a bit down after answering those questions. You can probably come up with at least a dozen reasons why you shouldn't follow through with something. Is that how you want to spend your precious time on earth? Zenflower Mandala Level 2 is available for you to sign up! Sign up now, and share this link with your friends. Zenflower Mandala Level 2 . If you haven't already signed up for Zenflower Mandala Level 1, please enjoy Level 1 and Infinite Blooms for free, no coupon code needed. Zenflower Mandala Level 2 is all about exploring color, patterns, and learning to create your own mandala. 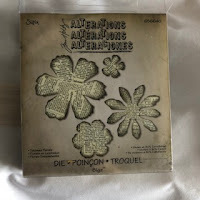 This is where you will be on your way to finding your own unique artistic style, your unique artistic imprint. Subscribe to this blog/website for all classroom announcements and new blog posts. If you have any questions, you can contact me using the contact form or in the comments here or in the classroom. Thank you, and enjoy the classes!